Counter to early indications that Intel already owned the trademark for the Thunderbolt high-speed I/O technology, recently discovered applications with the U.S. and Canadian trademark offices reveal that Apple has filed for the mark. Apple has leveraged a November 2010 trademark application for the Thunderbolt term in Jamaica to advance claims with the U.S Patent & Trademark Office and the Canadian Intellectual Property Office, MacNN reported on Wednesday. According to the USPTO, Apple filed an application on May 6, 2011 for a standard character mark that would associate Thunderbolt with a variety of computer- and data-related functions, such as computer peripheral devices, cables, connectors and digital and audio devices. The move comes as a surprise, as several documents, including the packaging for the early 2011 Thunderbolt MacBook Pros, state that Thunderbolt is a registered trademark of Intel. In fact, Intel itself lists Thunderbolt on its Trademark Information page. However, MacNN notes that a quick search of U.S. and Canadian records failed to turn up any Intel claims to the mark. Intel had originally codenamed the technology "Light Peak," eventually deciding on the name Thunderbolt during the development process. Apple's reported contributions to the project include the Mini DisplayPort standard and an "electrical solution" that saw the optical cables changed to copper in order to provide power. Prior to the official unveiling of the technology, speculation arose that Thunderbolt was Apple's name for the technology, similar to an earlier decision by the company to brand the IEEE 1394 technology as "FireWire." Rumors emerged earlier this week that Sony plans to implement Thunderbolt in the form of a Type-A USB jack. HP indicated on Tuesday that it had looked into Thunderbolt, but hadn't "found a value proposition yet." The PC maker has decided to stick with Intel's USB 3.0 specification instead. 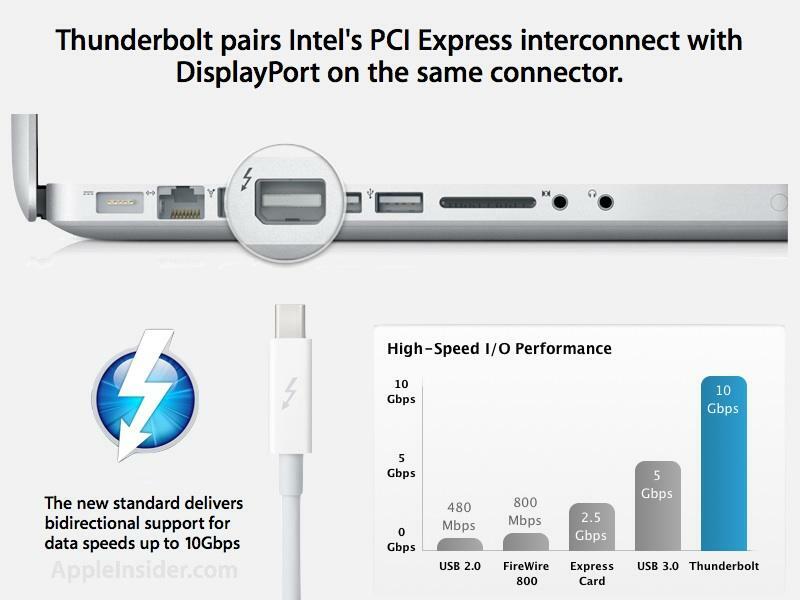 Intel stated last month its belief that USB 3.0 and Thunderbolt will be "complementary" to each other.